There are dogs and tents and motorhomes, classes and discussions on subjects like self-defense and ham radios, a community campfire and a firing range. Anyone is free to attend. According to the local militia leaders at Rondy, transparency is important because the militia movement in Alaska is nothing like its Lower 48 counterparts. Standing at maybe five-foot-seven, bearded and decked out in camo, John Root, III, founder of South Central Patriots (SCP), can be a man of few words. It might take him a minute to size you up, but once he does, he’ll level with you on what makes Alaska stand out. John Root III, founder of South Central Patriots, and his dog, Peewee. Root formed SCP in 2008. It was 25 degrees below zero in the Matanuska-Susitna Valley the day it started, with three people huddled around a woodstove in a garage. Since then, SCP has expanded to towns large and small across Alaska, a state with a total population of less than 740,000 people. They have members in Anchorage, Fairbanks, Delta Junction, the Kenai Peninsula. They have guys in Dillingham, Juneau and Ketchikan, too. Today, it’s arguably the largest homegrown militia group in Alaska. Root says national groups like APIII, Watchmen, Guardian Angels, Soldiers of Odin and Oath Keepers can rely on each other down in the contiguous United States—“they can get to their neighbors, they can get across state lines,” he says, his Jack Russell Terrier nearby sporting a red, white and blue hairdo—but if something happens in Alaska, those groups can’t be relied on. Root says he first ran into a guy from Oath Keepers back in 2013 during a food storage class SCP was hosting. He says the guy was wearing an Oath Keepers’ shirt, “looked all preppy” and was trying to poach SCP members; military and ex-military, registered nurses, airplane mechanics, anyone with refined skills. Oath Keepers, founded in 2009 by Elmer Stewart Rhodes, claim to have 30,000 members in chapters across the United States. Members of Oath Keepers have shown up to protests openly carrying firearms and have been accused of racism. Rhodes has a history of incendiary comments. In 2014, he called John McCain a traitor and suggested that he should be tried for treason. According to SPLC reporting, there are currently zero hate groups in Alaska. There are, however, 10 antigovernment groups, which, given the state’s small population, is a fairly large amount. While militia groups in other states have a history of antigovernment rhetoric and domestic terrorism, the militia groups at this year’s Rondy say they are more preoccupied with self-reliance and preparing for natural disasters. The sixth annual Rondy took place on the weekend of June 23, 2017. SCP, the Anchorage Municipal Defense Force and Anchorage Citizen’s Militia were among the groups in attendance. The event is described on its Facebook page as an annual gathering of likeminded folk for the purpose of networking, training and trading. The property Rondy sits on, roughly 113 miles north of Anchorage, is a 51-acre piece of land owned by Ed Wick, an amiable, giant of a man who’s missing one of his front teeth and a couple in the back. Near Anchorage Municipal Defense Force founder Rick Ford’s campsite three rifles lean against the bumper of a pickup. 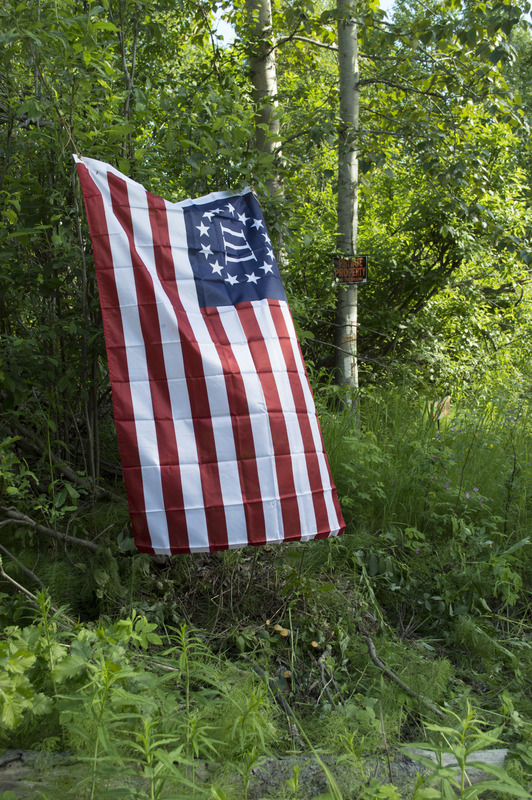 A rifle, a SOCOM 16, hangs across Anchorage Citizen’s Militia founder Eric Hecker’s back. 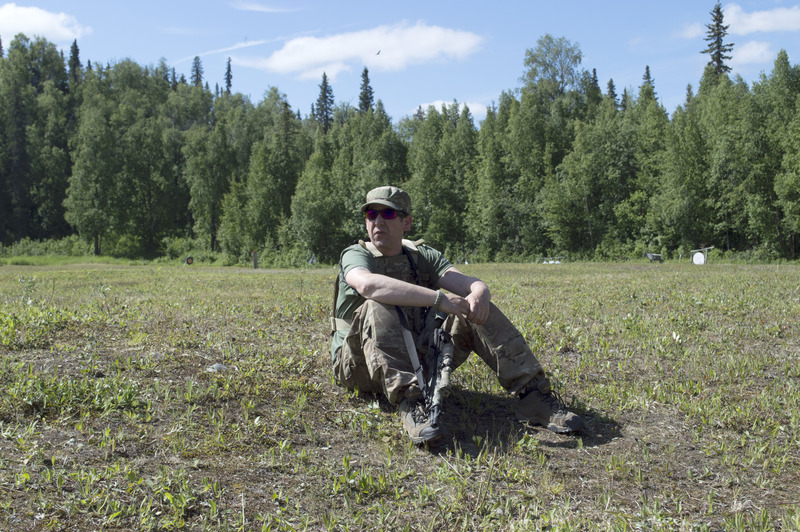 Alaska Citizen’s Militia founder Eric Hecker sits near the Rondy firing range with his rifle. The relationship between the militia lifestyle and firearms, Hecker says, is inherent to the Constitution and the Second Amendment, and that the ability to defend yourself, with a weapon, is integral to life, liberty and the pursuit of happiness. Hecker adds that, for most people, the word “militia” has a negative connotation because there has been an intent for it to be understood that way. However, he says that was not the intention of the founding fathers. Anchorage Municipal Defense Force founder Rick Ford sits near the Rondy community campfire following a class on the U.S. Constitution. 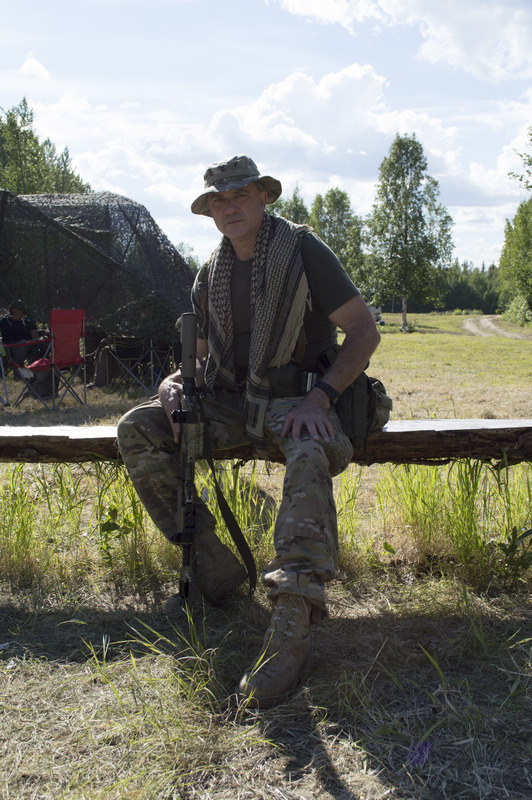 When asked how he gets past the negative perception of militia groups—that their philosophy is based on a history of violence and that their antigovernment rhetoric is fueled by paranoia—Root says that he would prefer that people don’t compare SCP, or affiliated Alaska militias, with other militia groups, and that they should be judged by the merits of their own actions and words. Newcomers to Alaska’s militia scene may have other ideas. 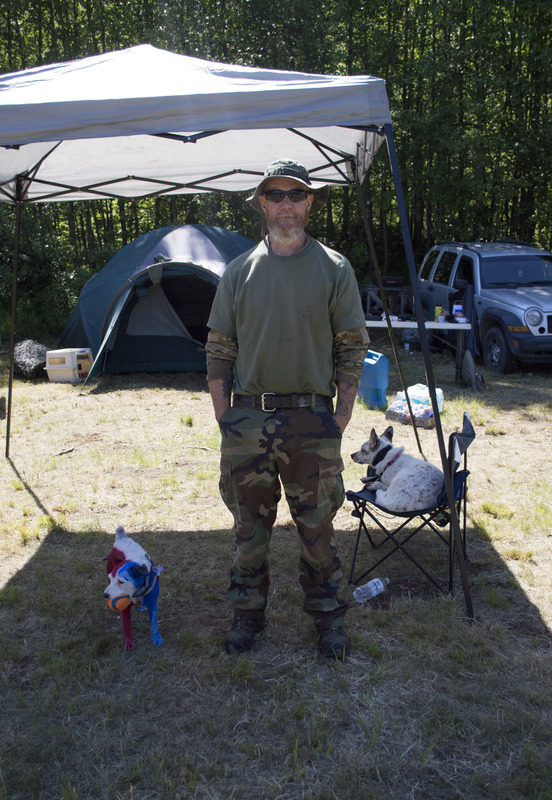 In 2009, the co-founder of the Michigan Militia, Norman Olson, moved to Alaska. That same year, he held a recruitment speech in the small town of Nikiski, Alaska, about 170 miles south of Anchorage. Back near the Rondy community campfire Root mentions the notorious Olson. Hecker, like others in the movement, believe that in the event of a natural disaster, invasion or total collapse of government, no one is coming to help. So, while other militia groups in the Lower 48 are concocting theories about a totalitarian government takeover or looking to the skies for black helicopters, Alaska militias are busy preparing for natural disasters. “I guess we would like to say we’re a little bit more realistic,” he says. Hecker references a cheatsheet.com article he posted on Facebook titled The Most Dangerous States in America in 2017. “Alaska is ranked number one, with Anchorage showing up very high as being wildly violent,” he says, “and I agree with that. It’s great. I love it because freedom is dangerous. So, the fact that we show up as the most dangerous place to be is really screaming that we’re also the most free.” The appeal of Alaska is freedom, he says, which is also key to the militia movement. Alaska militia groups are inherently more independent than militia groups in the Lower 48, says David Luntz three weeks after Rondy. Luntz was the founder of the Central Alaska Militia until it folded early last year, and now acts as a point of contact for public relations, recruitment and group coordination for militia groups throughout Alaska. He recruits by putting people in contact with the group closest to them. If no group exists, then Luntz encourages the recruit to start their own. He says that he is the lead point of contact for Oath Keepers and national Three Percenter groups in Alaska. Although Luntz says he doesn’t particularly like working with national groups, he says it’s necessary for three main reasons: to imitate success, identify what doesn’t work and for intel on current events. “[Staying in contact with national groups does] lend a level of coordination, intel and awareness of what’s going on in the Lower 48,” he says. In 1964, a 9.2 earthquake caused massive structural damage throughout southcentral Alaska. It lasted four minutes and 38 seconds, induced ground fissures, tsunamis, widespread power outages, $311 million in damage and the deaths of about 139 people. Anchorage—Alaska’s largest city—sustained most of the damage. It is the second largest earthquake ever recorded and Alaskans weren’t ready for it. That scenario, and the possibility of it happening again, is one reason for Alaska-based militia groups to prepare. “If the earthquake of ‘64 were to happen tomorrow, in your neighborhood, would you be a hindrance to your neighbors, would you be a burden, or would you be helpful to them?” Hecker asks. This story was updated on July 26, 2017.